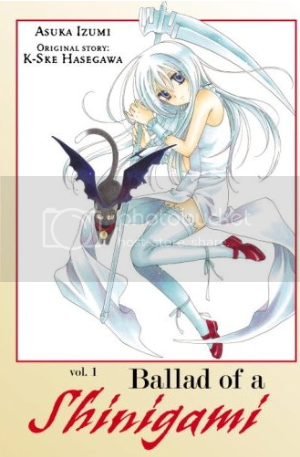 CMX’s newest release, Ballad of a Shinigami by Asuka Izumi, is the manga adaptation of the light novel by K-Ske Hasegawa. It follows Momo, the cutest little shinigami (a “God of Death” or grim reaper) that you’ve ever seen. Along with her animal familiar Daniel, Momo watches in the shadows as the human drama plays out in front of her in the world of the living. Ballad is not so much of a serialized series as it is a collection of short stories that Momo watches from the sidelines. Volume one includes a short prelude and three stories. Each story generally centers around a person who has recently suffered the loss of someone close to them, so they become all too aware of the cute death god watching over them. They become too preoccupied in contemplating their own mortality to realize all the love and life that still exists around them. As the reader, you will Immediately see that this series defies the typical makings of the shojo genre. Sure, Momo has an magical-girl style animal familiar, but that’s as far as it goes. There are no androgynous pretty boys nor sparkly flowery background. The character designs look more like moé shonen romance than shojo designs. And the artist does not use the shojo-style commentary panels to talk about her dinner or pets, she uses it to show Momo cosplaying. I did have to double check if this was supposed to be a shojo series, but sure enough, it originates from the shojo magazine Lala DX. The original novel, however, did run in a seinen prose anthology Dengeki Bunko. Because of this mixture of influences, the adaptation successfully crosses over between demographics, and I greatly admire it for that. The English adaptation seems to fall flat at moments. One example would be a little conversation where a boy teases the way a girl refers to her father. In Japanese, there are many words you can use to address your family based on formality and maturity. So I assume that the boy was teasing the girl for being too immature in the word she used to speak to her father. However, the translation sticks only to English words like “father”, “old man”, and “daddy”, which really don’t have the same implications that “otousan”, “chichi”, or “papa” have in Japanese. This ends up appearing like a pointless argument when used in this adaptation, and this conversation lasts for a couple of pages. I really wish that I had the original Japanese text just to figure out what the girl was being teased about. Perhaps the use of translation notes would have been better for this part? Likewise, having a collection of short stories rather than one long serialized series means that each chapter needs to quickly go through a setup, story, climax, and conclusion with in a few pages. So as expected, the story is very condensed and goes by quickly. The narrative jumps all over the place at times, often being told non-linearly and often becoming too confusing for me to follow. But perhaps the ambiguous narrative adds to the ultimate reason why I can, and do, fully recommend this series. Despite all the confusion, gloom, and depression building up through out each story, everything does come together for a satisfactory – and often surprising – conclusion. I wasn’t too happy with the series while reading the first story, but after it ended, I found myself thinking, “Wow, I liked that ending. I REALLY liked that ending.” I felt a similar experience with the second story. By the time the third and final story came around, I was fully convinced that Izumi was a great and entertaining writer. The Good: Well written storytelling with very satisfactory conclusions. The Bad: English adaptation fails at times. Narrative a little difficult to follow. Final Verdict: Ballad of a Shinigami defies the norm for shojo manga to present a great collection of stories about life and death. This entry was posted on Monday, June 29th, 2009 at 9:41 am by Scott	. « The Worst Packaging Ever?